This is a Case Study to show how demonstration days can have a positive impact on curriculum in primary schools. The aim of this project was to give the children an insight into the job of a tree surgeon and demonstrated safety equipment and tools that are commonly used. The demonstration coincided with the start of the children’s new topic on recycling. Key to the time of year, the school contacted parents and asked for Christmas trees that could be chipped, strengthening the home-school link. The demonstration took place on 7th January 2016 and lasted for 30 minutes. There were three classes from KS1. On the day the children were gathered around the wood chipper where all the safety equipment was explained to them and demonstrated by a team member. Then the children were shown a chainsaw and key components such as the engine, cutting teeth and safety lever. 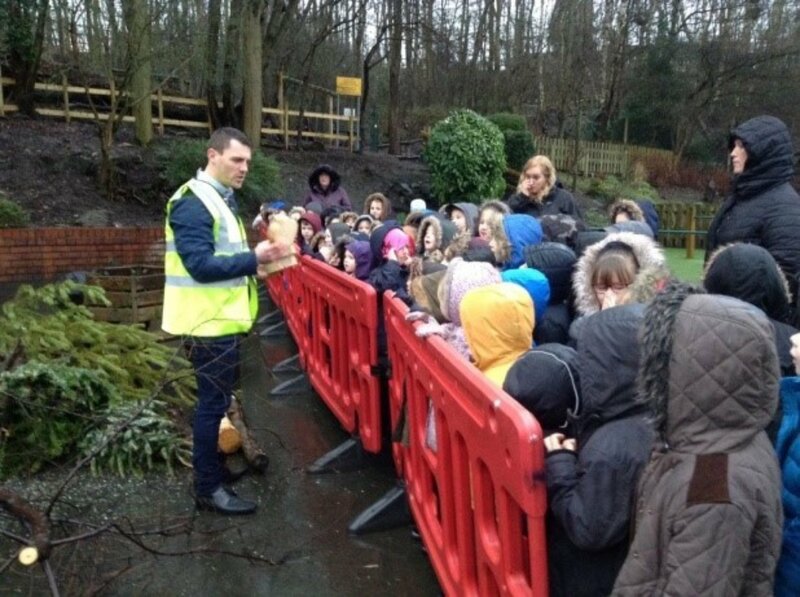 After that we got into the fun bit, demonstrating to the children the sounds and process of a tree being cut into small sections. The cut slices from the trees were then past around for the children to look at, feel and smell. We then moved on to explaining the wood chipper which was started up for the children to listen to, some of the children tried to explain the smell of the engine using words like smoke and car engine. While the trees were being put through the chipper we talked about how loud the sound was and what was coming out of the back of the machine. The chippings were then passed around for the children to use their senses to describe the chippings. The children then went back to their classrooms where they wrote in their books about the project which started their topic on recycling. "It was very well presented and the children wrote in their books that you explained very clearly how to use the wood chipper"
We are currently designing the EYFS area for the school and will be constructing a mud kitchen for them as the first phase of the work. Again, this will involve the children and will create more opportunities to bring life to the curriculum and the different roles involved in peoples jobs. We intend to undertake a series of workshops for the children linked to the EYFS grounds projects helping to support teaching and learning in new and exciting ways. Where it is not possible to directly involve the children, we intend to present additional demonstrations enabling the children to get involved by making mini models of some of the project items.